There really is a severe lack of empathy where autism is concerned. Allow me to demonstrate. Do I need to go on? 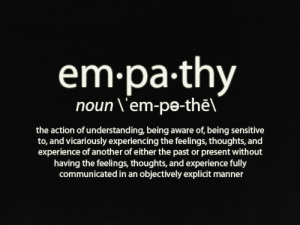 Are you starting to see where the lack of empathy comes into play? Just go and play with the other kids. You’ll have fun if you just make yourself do it. It’s not that loud. Just deal with it. You’re doing it my way whether you like it or not. Look me in the eyes when I’m talking to you. Stop being so rude. You have to give me a hug or you don’t get what the others got. Again, the list could go on and on. But I think you’re starting to get the picture. I won’t even go into the whole bullying thing. I think it’s safe to say we can all figure out where the lack of empathy comes in when someone is bullied, autistic or not. Yes, there’s a very distinct lack of empathy but it’s not necessarily coming from the autistics themselves. Sure, some autistics might not understand the thoughts or feelings of others. But then again, some autistics might just not care. Maybe it’s because they don’t understand but maybe it’s because it just doesn’t matter all that much to what they’re doing at the time. Then again, maybe some autistics care very deeply and are just unable or incapable of expressing it. That’s a very basic and rudimentary way to look at it. 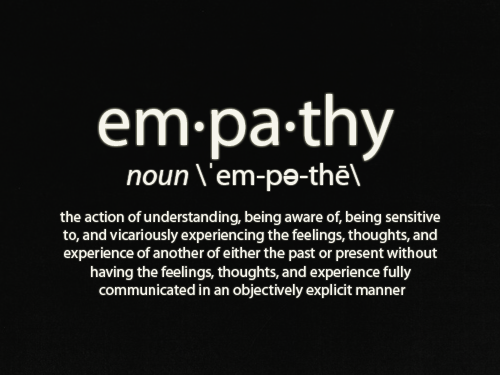 For more details and examples, check out Autism and Empathy. The bigger problem, as I see it, is the lack of empathy towards autistics, not from autistics. Instead of wondering if someone is caring about you or your feelings, consider how you can care for theirs. That’s the great thing about feelings. You don’t need to get them to give them. A couple of days ago, my wife and youngest child were out of town, leaving Cameron and I to play video games and spoil ourselves with treats. If you have a loved one with Autism, you can imagine how off guard this caught me. Luckily, I didn’t have to do a lot of talking, he took over. 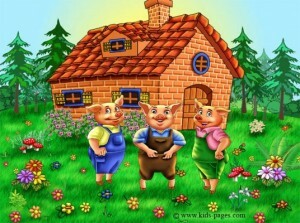 He explained to me how mad the pigs would be, he explained to me which ones would be happy. My first thought is on how proud of him I am. That he’s working so hard to understand the feelings of others… more so, feelings of three little pigs who, after all these years of being in this story, no one has ever stopped to think about their feelings. He’s trying to understand, he’s trying to know why. The more thought I put into it though, I begin to realize what a true testament this is to his teachers at his school as well as to my wife, his mother. While it is true that he’d never reach this point unless he wanted to and was ready to… it’s also true that he wouldn’t be acquiring the abilities nor desires to reach these milestones if it wasn’t for the hard work of those who work so closely with him. If you know my story at all, you know that my family picked up and lost virtually everything to move here so that he could be at this school… and in all he does, I know we made the right choice. But in little moments like this one… where he completely catches me off guard… I know that it was the best choice we have or could have ever made. To my wife Natalie and to the wonderful women at Cameron’s school that are doing so very well with him, thank you so very much. People tend to have a lot of questions about “feelings” when the topic of Autism comes up, the most obvious topics covered are the temper tantrums, the lack of eye contact and the refusal to hug or show love. Cameron is a very special boy who’s overcoming the odds, going from mild-severe Autism to… well, many people question if he was ever Autistic in the first place. However, he still is extremely reluctant to hug anyone, kisses are even more rare, temper tantrums still get the best of him… in short, he still has Autism. But he’s doing so well. One thing that has remained constant and I suspect always will for the rest of his days, is that he absolutely refuses to say “good-bye” to someone when it’s someone he loves and someone he knows he won’t see again for a while. If he knows he might see you in a day or two, or if you’re just some random person, he might say it… more than likely you’ll get a “thank you” or a quick “bye!” to get him out of there. But if you’re someone he knows, someone he cares about… there’s a very good chance that he won’t even want to be in the same room with you. And it’s not because he’s mad, or sad, or scared. And it’s not because he doesn’t feel it. It’s because it hurts too much. It’s because he feels it all too well, on a scale you and I will likely never even imagine. He doesn’t say “good-bye” because he can’t say “good-bye”. I have yet to hear him say it to someone and mean it… to someone he cares about. I doubt I ever will. Do they feel love even thought they don’t hug you, or kiss you, or look you in the eye? In my opinion, if you were to put the amount of love Cameron feels into a scale and the amount of love you feel into a scale… an observer would be more inclined to ask you that question instead of him. And you know what? Those that know Cameron, they get it. And they know they’ll never hear him say “good-bye” and they are just fine with it.